I don't know about you, but when I pick up a book by a new author I always tend to wade in a bit gingerly, wondering whether I'm going into a book with a fabulous synopsis, only to be disappointed--or finding my next favorite author. In the instance of Jaime Jo Wright's moody, atmospheric Bethany House debut, once I got a few chapters in, I was hooked. I'm always a lover of a good mystery. Since Jane Eyre is one of my top favorite classics, you can probably guess that I don't mind some spooky Gothic tones to a story, either--as long as they don't actually cross over into the supernatural, which I simply don't want to deal with! This one has a very good spooky vibe (seeing women vanish in the hall; hearing piano music from an empty house) that was just enough to send a few shivers down my spine without crossing the line. Kaine, the modern heroine, is a young widow struggling with a stalker who she is sure had some hand in her husband's death. When the police department begins to cast doubt on her own sanity rather than being able to find any hard evidence of stalking, the impulse for flight kicks in, and she makes an impulse purchase: Foster Hill, a deserted Victorian mansion in her grandfather's hometown. She buys it sight unseen, only to find a wreck of a place that is ready to fall down around her ears. A sheaf of daffodils on the front steps terrifies her; is it possible that her stalker has already followed her here? I liked how the author plays with her fears here. Kaine literally gets pushed into a corner, in over her head with the home repairs, scared by a home with little security, and terrified of what is around the next corner. Finding hints of a past tragedy in pieces of the shabby place--behind trim-work and under floors, for example--occupies her mind, but also raises her fears, as it seems the house is still in the grip of an evil doom that happened in the past. As the threats against her grow less subtle and more aggressive, she has to fight to decipher reality from imagination and struggle to retain her grip on her courage. Ivy, the historical heroine, lost her brother to drowning several years before. At the same time, Joel, her brother's best friend and her young almost-suitor, disappears without even bothering to attend the brother's funeral or say goodbye. Her point of view opens with the murder victim, a young girl, being found on the Foster Hill property, and with Ivy journaling her doctor father's autopsy of the young woman. Pretty quickly we find out a few things about Ivy: she's never quite recovered from losing her brother and dear friend at about the same time, and she has taken over the task of writing obituaries for people in town. The idea that someone's life could be simply forgotten has a horror for her. But the town, misunderstanding her reserved personality and her passion for the stories of the dead, ostracizes her and believes she has "second-sight." Ivy also is pushed to her limits. She must face townspeople she would prefer not to talk with; she must face the past, in the form of Joel and the memories he stirs. She becomes passionate enough about the murder that she becomes frustrated about the lack of results from the investigation and ends up literally stepping out to put herself in danger to find clues. The Foster Hill House almost becomes its own character. Personifications of it include the idea that it is keeping secrets and that it may never be a "normal" home because of the past tragedies that have occurred under its roof/on the premises. I have always been fascinated with old homes, so this story was right up my alley in that respect. I didn't have any trouble at all picturing the shabby paint, the tumble-down exterior trim, the loads of dust, and all the other details. I found the parallel mysteries to be equally engaging. Both Kaine and Ivy are using secrets to find out what actually happened at Foster Hill in the past. Ivy uncovers ugly secrets, and someone in Kaine's present is determined to keep those same secrets, even many decades after the crimes. Both women kept me turning the pages, and since there were two stories going, I gravely feared that at least one of the ladies wasn't going to get the "happily ever after" I wanted. You'll just have to read the book to see if my fears were correct. Other than general spookiness, there is talk of a woman having been violated; women being kidnapped and/or sold; women threatened with violation; and a child born out of wedlock. All of this is non-graphic, except for a few more details in the initial autopsy in the historical storyline. For those of you with issues reading about small spaces, there are small spaces/being locked in small spaces. Each lady had a possible love interest, although romance in the story wasn't the main point by any means. Both of these men, Joel and Grant, were likable and strong men who were well-suited to the ladies, although I would give Joel the edge for being memorable. There is a Christian aspect to the story, understated but solid. Overall, if you like character-driven mysteries, dual timeline novels, or books with a good dash of spooky, pick this one up. It's an enjoyable journey. 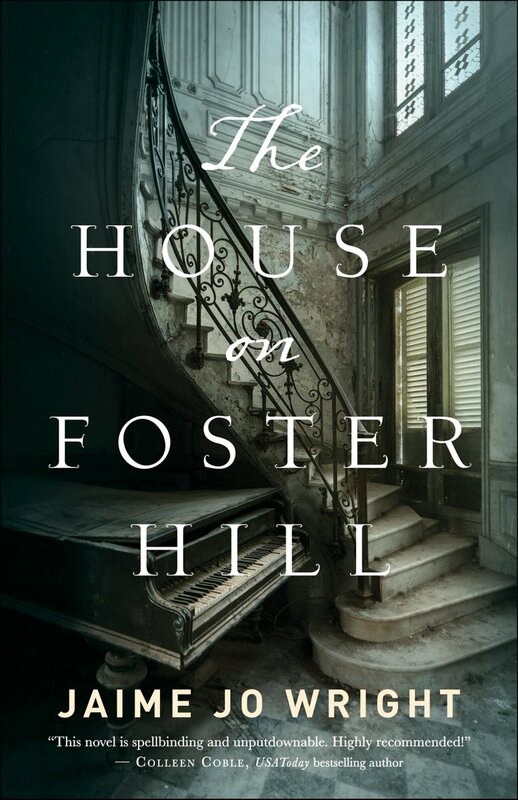 Purchase a copy of The House on Foster Hill on Amazon.